Few things are more horrifying than the feeling of sending an email you didn’t mean to send. Maybe it was an angry letter to a boss, a poorly-written connection inquiry, or a gossipy email that went to the wrong recipient. 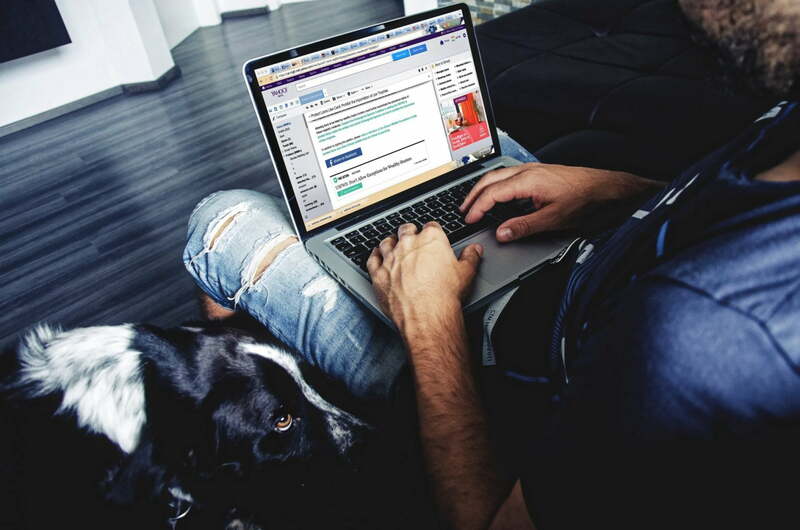 Whatever the case may be, these blunders create instant email regret, and they can have disastrous consequences down the road. Luckily, there’s a smart new feature to help prevent them from happening: Undo Send. Offered by Gmail, “undo send” can act as a time machine for your email – yanking back emails you didn’t mean to send and saving you the embarrassment that goes along with them. This guide will tell you how to enable the feature in your account. Offered by Gmail, “undo send” can act as a time machine for your email – yanking back emails you didn’t mean to send and saving you the embarrassment that goes along with them. This guide will tell you how to enable the feature in your account. Gmail’s Undo Send was introduced into the Gmail suite several years ago, although it has only recently become an official feature of Gmail. The feature is free and available to the public and can be installed with just a few clicks. 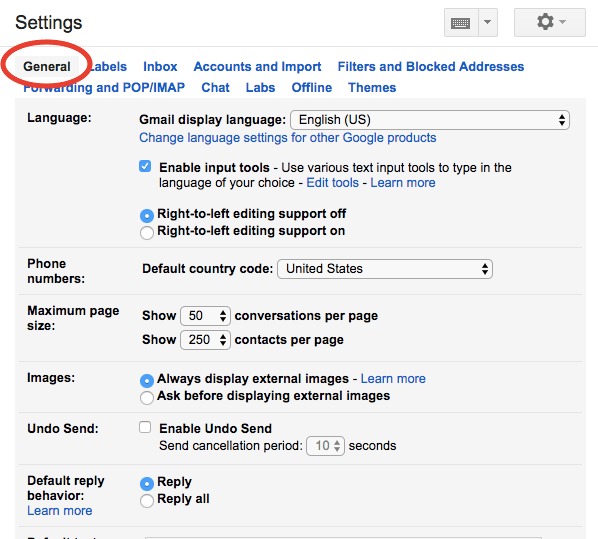 In your Gmail dashboard, click the gear for “Settings” in the upper right-hand corner. 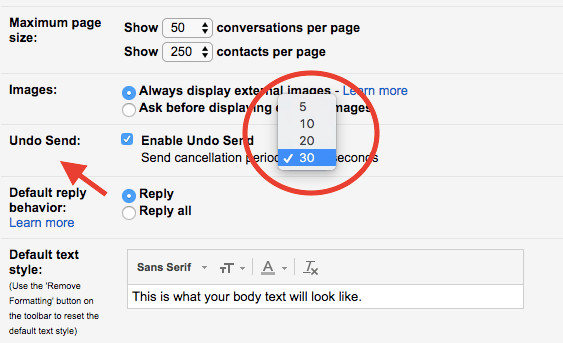 From there, navigate down tot he box that says “enable undo send.” Click it and then select the duration of your send cancellation period – from 10 to thirty seconds. Once you’ve enabled the feature, using it is simple. After you’ve opened a message and sent it, you’ll see the sent confirmation banner at the top of your screen. To unsend the message, just click “undo.” Your computer will think for a moment and then tell you that the message sending has been undone. Recall old Messages. Do you suddenly regret that message you sent your coworker last week? You can’t get it back with unsend. Since the feature has a built-in time frame (from 10-30 seconds), it won’t work to call back messages that have gone beyond that point. Undo old Group Emails. If you made a “Reply all” blunder and only realized it later, it’s probably too late to get the email back. If you check and compose emails from your phone, it’s smart to install the feature there, as well. To install it, first make sure you have the most recent version of the iOS. From there, open the Gmail app, tap the “compose new message” icon, and start writing. Send the email as normal. In the app, the unsend feature works a bit differently than it does in the desktop version. You’ll see an “unsend” link at the bottom of the screen – just click it to recall the email. Be advised that, as is true with the desktop platform, the mobile app only allows a few seconds for you to undo the action. If you get to the email within this time frame, it will bounce back to your outbox, ready for edits or alterations. If you’re using an Android system, you’ll have the option to confirm your messages before sending them. While this is helpful, it won’t undo mistakes like Google’s feature will. If you make an email blunder, Gmail’s “Undo” feature can help you fix it. An ounce of prevention is worth a pound of cure, though, and it’s always more effective to give your emails a careful once over before you send anything on its merry way.